At WaterfrontAuthority.com, we describe “Key West” as the 11-mile stretch of the Florida Keys beginning at the southernmost point in the United States at MM0 in Key West to Shark Key at MM11. It fits the map search page nicely and Key West Naval Air Station on Boca Chica Key at MM7-8 does have Key West in it’s name. 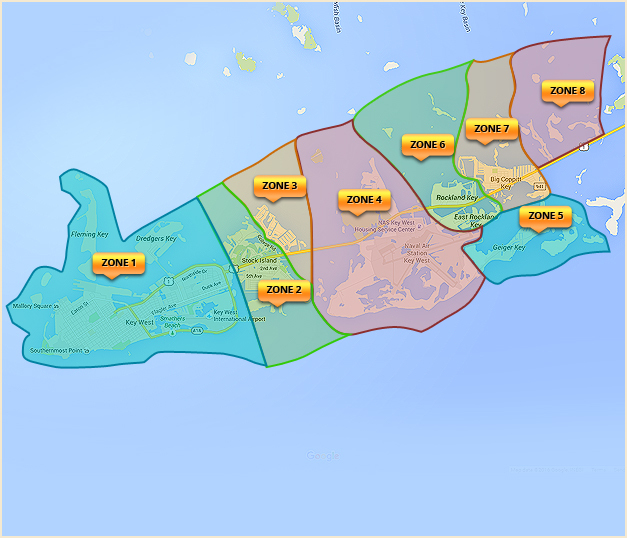 Other islands within the Key West area include Big Coppitt Key, Geiger Key, Rockland Key, Key Haven, and Stock Island. Key West is like no other place on planet earth. If the combination of nightlife, excitement, and activity is your cup of tea, then you will fit right in here in Key West. Drive here, fly here, or ride a ferry here. Regardless of how you get here, you won’t ever want to leave. Boating, fishing, museums, Duval Street, fresh Florida lobster, cruise ships, treasure hunting, and interesting people in this vitally strategic location equate to never ending fun. If Key West is where you feel most comfortable, you need to narrow your search to a specific Zone, or key, within the Key West area. Some prefer Key West, while others prefer Stock Island, or Geiger Key. Your search begins here at WaterfrontAuthority.com. Your next step is to contact Trae Zipperer and arrange a day and time to meet in the Keys. Once in the Keys with an experienced waterfront real estate broker to guide you, you’ll be able to select the best property and become an owner in this tropical paradise with gin clear water and water sports second to none.